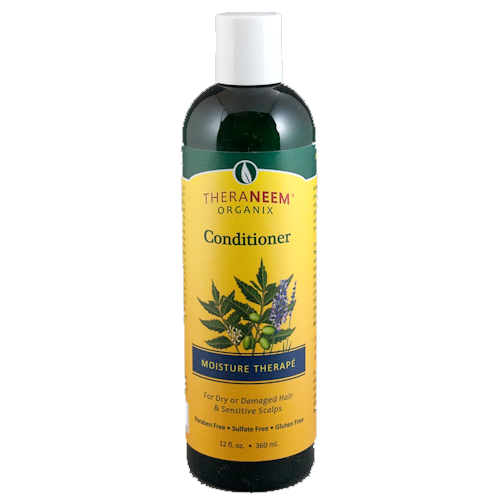 TheraNeem Moisture Therape Conditioner is specially formulated for dry or damaged hair & sensitive scalps. Use TheraNeem Moisture Therapé Conditioner to restore moisture to the hair and scalp. Now with even more organic Neem oil & Neem leaf extract, jojoba oil, panthenol & rice proteins, this formula will hydrate the scalp & reduce split ends, leaving hair soft and sleek. Prepare to experience intensive Moisture Therapé. Can't belive I have found an all natural product which makes my hair feel so soft and refreshed. Will purchase again. I already use neem shampoo,(read my review) so using the conditioner makes sense too, I have tried all the neem conditioners and find them all excellent, this one in particular is good, I do alot of sea swimming in the summer which plays havoc with the condition of your hair, but after a wash with neem shampoo and conditioner my hair feels lovely and soft. ( I have very long hair) I would highly recommend this product. (really love the coconut one too, but my partner dislikes the smell of coconut, and the other conditioner, although works really well, it has a smell of mint, which is not for me. Both Neem conditioner and shampoo are worth paying the little extra. Really glad I came across it years ago. I bought this conditioner after having used the neem and coconut shampoo that had fantastic results. The conditioner was a real disappointment. It left my hair heavy and quite difficult to comb. Obviously not for me!!! Now I have to find a way of using the rest of it! !